What kids and their parents don’t understand about bullies that prevent them from getting the problem to stop. We all learned as kids that reporting a bully is kind of pointless. Not only are the adults unable to get the bully to stop, when the bully finds out you reported them, they retaliate and make your situation worse. It’s actually better to just do nothing. Bullies bully because it works. They get what they want from being aggressive with other kids (or other adults if the problem is a workplace bully). When you report a bully, they don’t get away with it and this makes them mad. So of course they retaliate. They are trying to make the cost of reporting them so high, that you won’t report them anymore. 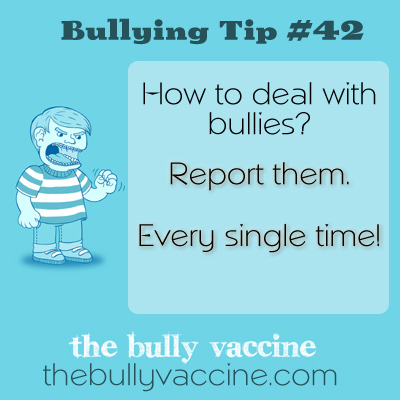 The problem is that if you don’t report them, they get away with bullying and it will continue. If you want it to stop, you have to make it stop working for the bully. Which means, you have to report them. But, reporting them makes them retaliate. So, what should you do? To get a bully to stop you have to increase the consequences for their bad behavior and decrease the reward. Reporting them does both. It tells the bully you aren’t scared of them and it provides them with a negative consequence that increases the cost of the behavior. The key is to not let their attempts to retaliate stop you. In order for this to work, your response has to be the same every time they act poorly. You need to response in a neutral tone of voice, very matter of fact and you need to report them. And document them and what they are doing. Getting a bully to stop is a process that takes place over time. Once you start, keep going until they stop. Will they get more aggressive? Yes. Plan on it. And by plan on it I mean, make sure that you have a plan in place for what you will do WHEN (not if) they bully you again. Know what you are going to say, how you are going to get help and how and who you plan to report this to. It is the consistency of your reporting OVER TIME, that gets this behavior to stop. It would be nice if you could just report it and have it stop, but it doesn’t work that way. You can wish it would all you want, but it doesn’t. So saddle up and be prepared for your bully to get more obnoxious and when they do, instead of thinking – this isn’t working, realize, you are causing them to behave this way! You are in control and the worse they behave, the more obvious their bad behavior becomes to others and the easier it becomes for the adults around you to intervene on your behalf. Can you do this? Yes, but only if you have a plan in place for what you will do when the bully tries to retaliate. My book can help, but if you are being chronically bullied, I do recommend the toolkit as that includes both the book and worksheets to help you and your parents develop a strategy to not only get the bullies to stop, but to keep you safe while you get them to stop.